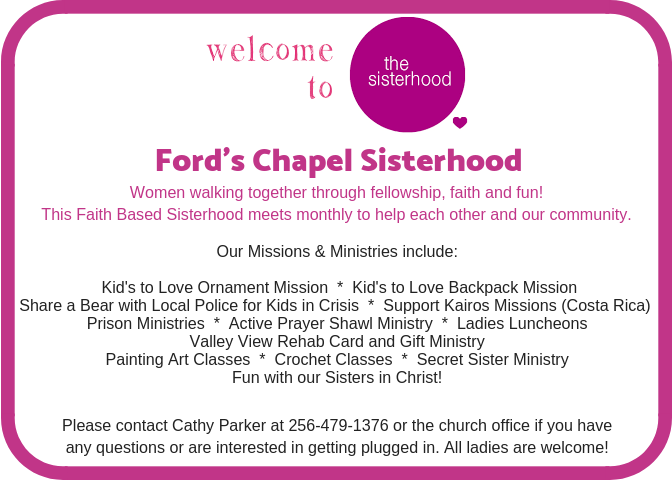 The Ford’s Sisterhood provides a place for women to be united as Sisters in Christ through Faith, Friendship and Fun. The Sisterhood meets the 3rd Sunday of each month for fellowship, refreshments, dynamic speakers, devotionals, and missions opportunities. Come and join in as we grow together as sisters in Jesus Christ. Please contact the church office or Cathy Parker if you have any questions or are interested in getting plugged in.